Albert Edwards is back from holiday, has killed off his bout of seasonal effective disorder, and now thinks U.S. market participants are poised to overreact in a big way to new inflation data. We’ve heard the rent story before, from Deutsche Bank. 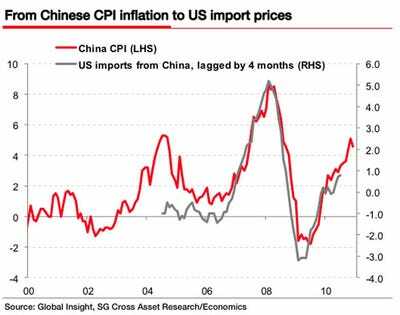 The China pass through is the obvious impact of rising inflation there. And the economic recovery hitting full steam is sure to boost CPI. So there’s going to be a rise in inflation, but why are investor’s so nervous? And given the jitters that abound about the impact of QE on inflation, I would expect the markets to over-react to these developments. Many market participants who believe an inflation take-off is just around the corner will then have more evidence to berate Central Banks for being well behind the tightening curve. Because market participants are on edge, we’re going to see a “melt-up” in bond yields ending the down trend that is a “total over-reaction,” according to Edwards. That over-reaction could cause a ton of problems for the U.S. economy, notably increasing pressure on the U.S. government and its deficit problem.